Granbull, The Fairy Pokémon. Its well-developed lower jaw and heavy fangs are its weapons. As long as it’s not provoked, it rarely bites. More timid than Snubbull, this Pokémon is doted on by young people amused at the contrast between its looks and its attitude. While it has powerful jaws, it doesn’t care for disputes, so it rarely has a chance to display their might.Although it’s popular with young people, Granbull is timid and sensitive, so it’s totally incompetent as a watchdog. 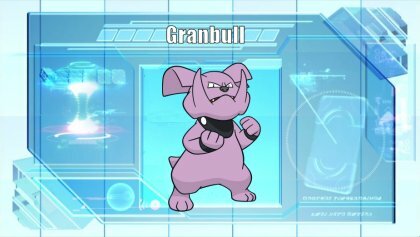 Granbull is a Pokemon with all the right tools but lacks the means to execute it. It boasts access to two of the best abilities in the game, but has too low of a Speed stat to really abuse them effectively. However, Granbull still functions well as a defensive pivot with its high base power allowing it to still pressure threats while being quite tanky. Unlike other Pokemon like it, such as Landorus Therian in OU, Granbull has access to strong support moves such as Heal Bell and Thunder Wave allowing it to cripple threats as well as wall them. 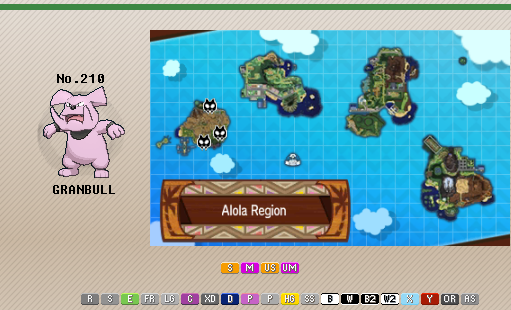 +Abilities - Granbull has access to some really nice abilities, Intimidate being one of the best in the game. Quick Feet, while better when Granbull was Normal type due to STAB Facade, is also still a powerful ability. While less strong, Rattled is nice in the right situation. +Movepool - Granbull has a stunning movepool, packing a lot of coverage options on both offensive and defensive fronts. Defensively, Granbull has moves such as Thunder Wave and Heal Beal on top of the general support movepool such as Roar and Toxic. Offensively Granbull has access to nice coverage moves such as Earthquake, Fire Punch, Stone Edge, Close Combat, Low Kick, and Ice Punch, and Crunch. -Low Special Defense/Speed - Granbull has some terrible Speed stopping it from really abusing either Quick Feet or Rattled as the bonus it gains is small. This contributes to making Granbull easy to revenge kill with its low Special Defense, and the large amount of heavy hitting Special Attackers with high Speed in its power range. -Dependent on teammates - Granbull's low Speed and lack of a good boosting move, Granbull is very dependent on its teammates to help deal with threats for such as physical walls and its counters. 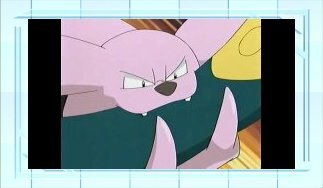 Intimidate - Lowers the opposing Pokemon's Attack by one stage - One of the best abilities in the game, Intimidate allows Granbull to pressure out a lot of threats. Combined with its typing this allows Granbull to pivot into some of the top threats in formats where you'd commonly use it. Quick Feet - Raise Speed by 50% when affected by a status ailment - A powerful ability, Granbull has a hard time really abusing it in the way its former main competition Ursaring does though, since being a Fairy-type means it no longer has STAB on Facade. Rattled - Raises the user's Speed by 1 stage when hit with a Bug, Dark, or Ghost move - Overall the weakest of Granbull's abilities, Rattled still has some uses but is overall inferior to Granbull's other abilities. Aiming to abuse Granbull's strong movepool and base Attack, a Choice Band is a solid option. Intimidate is a strong option as it creates room for Granbull to get in but Quick Feet is also good for switching into Status moves. Play Rough is the STAB option of the set and a solid option as Fairy isn't resisted by a lot. Fire Punch and Earthquake are there for the Pokemon that would sponge Play Rough while Stone Edge gives neutral coverage and hits Poison types with Levitate such as Weezing. The EV investment into Speed is needed so Granbull can outpace threats such as Drampa and Guzzlord. With the prominence of Fighting-types in its range, Granbull makes for an excellent wall. Intimidate is the only option this time as it helps shore up Granbull's bulk to complement the Defense EVs for maximum physical bulk. Heal Bell allows Granbull to cleanse the team as well as function as a one time heal with a Normalium Z. Thunder Wave allows Granbull to cripple fast threats such as Sceptile but Toxic is an option to stall out walls. Play Rough and Earthquake round the set out for STAB and some coverage, but Earthquake can be switched to Roar so Qwilfish doesn't boost on Granbull. While better before getting Fairy typing, Quick Feet still earns a mention as it turns Granbull into a revenge killer (sort of). Adamant can be used but as Quick Feet scales off of the Speed you have, so Jolly is really nice here. Play Rough makes for a powerful STAB with Fire Punch and Earthquake rounds out coverage against Steel-, Fire-, and Poison-type threats. The last slot is open for any move of choice, strong options being Super Fang for chunking walls, Close Combat for Normal threats, Facade for a 140 base power neutral move to hit Weezing, or Stone Edge for flying threats such as Charizard. -Bulk Up - Being the better of Granbulls boosting moves, Bulk Up mixed with Substitute and a defensive EV spread can make Granbull a pain to deal with without a phasing move. 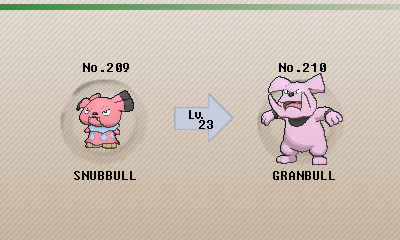 However, this leaves Granbull with only 2 move options. -Super Fang - Super Fang is a niche move but allows Granbull to just cut a foe's health in half for targets that would otherwise give it a hard time. - Sticky Web - With Granbulls low base Speed, Sticky Web is a strong option as it will allow the more offensive Granbull sets to outpace even more threats. In particular this also avoids being easily revenge killed and overall makes it harder for slower teams to handle Granbull's high Attack. -Electric Types - Braviary shuts down Granbull hard, so having an Electric partner isn't a bad idea. Eelektross is one of the best choices with its massive movepool and Levitate allowing it to check things other Electrics in tier can't, such as Rhydon and Steelix. Manectric is another strong option due to Flamethrower/Overheat access, so it can beat the physical walls that stop Granbull. -Mesprit - With Granbull's struggle against Poison types, Mesprit is a nice partner for Granbull. With the added boost of Levitate, Mesprit can switch into physical walls that give Granbull a hard time such as Steelix and Rhydon and pressure them out with its decent movepool. Lastly Mesprit's access to U-Turn will allow Granbull free switch-in opportunities. Don’t expect to see Granbull running around this format, since it is outclassed by a variety of Pokemon that can outperform anything this mean dog can do. Regardless, this tough pup has a few features that are worth mentioning. Granbull actually has a decent attack stat to capitalize on a fully physical set. Play Rough is a reliable physical Fairy-type attack with the added bonus of having the chance of dropping the opponent’s Attack stat, sans the occasional miss. Fire Punch or Ice Punch depends of your needs if you want to incinerate Ferrothorn or chill out Landorus. Earthquake or Rock Slide really depends on what you want to cover, as Earthquake aids your coverage against both Steel- and Poison-type Pokemon, but Rock Slide deals with the plethora of Flying-type Pokemon. Your last slot depends on your team needs; Close Combat targets a single Pokemon which avoids a drop in power. Stealth Rock reduces longevity of your opponent if the match is a full on 6v6. Protect eases prediction. Again, healing your Pokemon back to a health range can be accomplished by Iapapa Berry. Alternatively, Assault Vest can be used to buffer Granbull’s mediocre special defense if you choose to only use non-defensive moves. - Granbull easily benefits from Life Orb, though the recoil is not welcomed. - Fairium-Z can be considered for a single Fairy-typed nuke. - It can run a decent supporting role with Heal Bell, Thunder Wave, and Intimidate. -Qwilfish - Qwilfish really hurts Granbull as its defensive sets can pivot easily into Granbull sets that lack Earthquake, while offensive Swords Dance can set up on Granbull due to its access to Intimidate. -Braviary - With access to Defiant, Intimidate can just add a boost onto an already powerful Pokemon. Braviary is also fast enough to just set up Substitute in Granbull's face, blocking Thunder Wave from a defensive set and set up with Bulk Up. -Physical Walls - Without access to Swords Dance, Granbull really can't handle Physical Walls. While Granbull can hit most for Super Effective damage, it has to lean on wearing them down and can't just 2hko them like other higher tier attackers such as Haxorus. 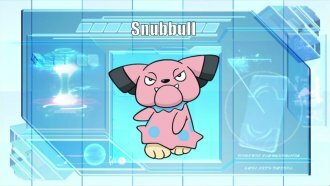 With Intimate being the crux of its ability to tank physical hits, Snubbull has been oriented to dish damage whilst tanking a hit or two. Play Rough is its best and only choice for a physical stab attack, hitting Vullaby and the array of Fighting-typed Pokemon that dominate the tier. Thief is a surprise attack against Ghost-typed Pokemon, especially when Berry Juice has already been activiated which allows Snubbull to deal damage and steal the opponent’s item for its own use. Earthquake or Fire Punch depends on your needs, as they cover completely different set of opponents. Either one aids in the elimination of its two weakness. Your last slot depends on what you want to accomplish. Full on attacker has its benefits if you opt for a set with Earthquake as your last move. Thunder Wave establishes much needed speed control, especially if Snubbull’s Intimidate forces a switch. Bulk Up is not necessarily used to establish a sweep, but rather to be used early in the match to increase its ability to tank and deal damage. Substitute can be considered if you want a way to avoid being hit with status. - Heal Bell can be considered if you want to sacrifice a move slot for it. - Taunt can impede passive Pokemon from being able to function properly. - Pokemon that fear fighting typed Pokemon are going to benefit from the presence of Snubull, such as commonly used Steel-typed Pokemon like Ferroseed and Pawniard.